You may be thinking “haven’t I see this recipe on here before?” and if you are, the answer is…kind of. 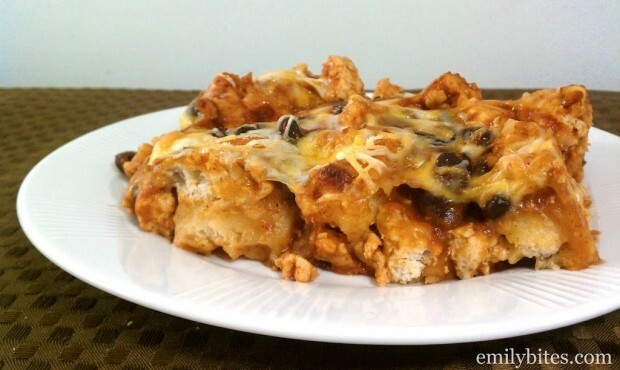 Bubble Up Enchilada Casserole is one of the first recipes I ever posted and it’s been one of the most popular as well. While I’ve always been a big fan of the flavors (what’s not to like?) I never found the original very filling for the points. I actually wavered about whether to post it in the first place. When people would rave about the recipe, I used to think “really?” because although it was delicious, it just didn’t satisfy me. I’ve been meaning to make some adjustments to the recipe for a while now, especially since some of the ingredients I originally used have become difficult to find. 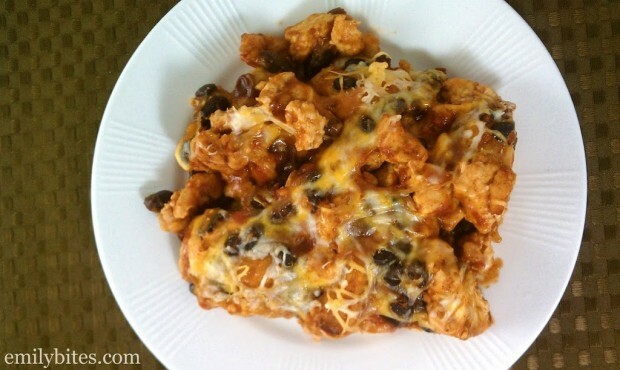 This time I used leaner ground turkey (and more of it), regular (as opposed to reduced fat) biscuits, a little less cheese and I added a can of black beans to make the dish more filling. I know a lot of people really liked the original recipe, but I urge you to try it this way – it’s so much better! I was definitely satisfied with one serving and I loved the addition of black beans to the flavor profile. This is the way I wish the recipe had turned out the first time! I’m keeping the old version on the site, but even if you loved it that way I think you should give this makeover a try. You won’t regret it! Preheat oven to 350 degrees. Lightly mist a 9 x 13 baking dish with cooking spray and set aside. Brown turkey in a large skillet or sauté pan. Add the enchilada sauce, tomato sauce and black beans and stir to combine. Stir the biscuit pieces into the meat mixture. 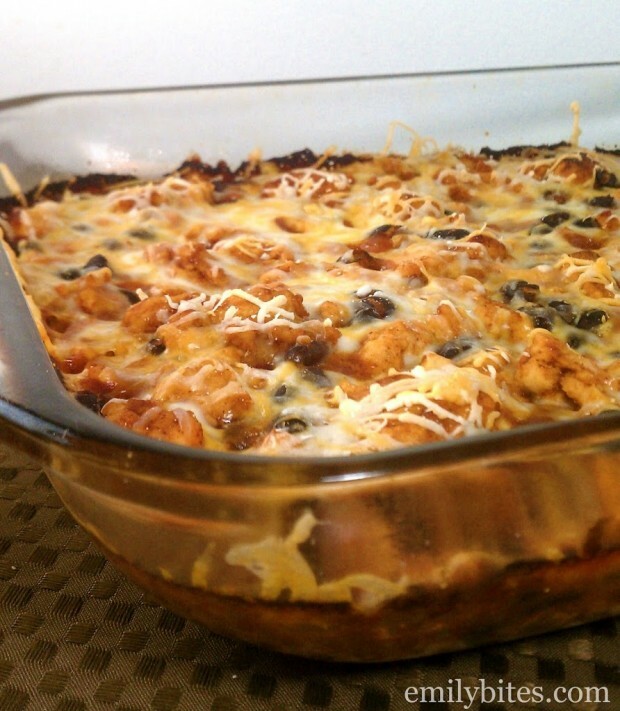 Transfer the entire mixture to the prepared baking dish and spread out evenly. Bake for 25 minutes. Remove from the oven and sprinkle the cheese on top. Bake an additional 10 minutes. Let stand for 5 minutes before serving.